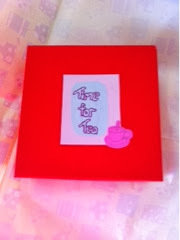 One of Emily's friends asked me recently if I'd knit her a tea-set for her birthday. But with a crochet version. It took about 2 1/2 weeks but looks lovely now it's done. And I got some lovely wooden buttons for it. A Christmas present for me! I been working so hard making toys and knitting clothes - I'm only starting on some of my Christmas presents now. How bloody late is that! So I though I would treat myself. I've loved Julie's toys for so long and was so happy when she finally published some this year. I bought both the girl and boy bunny patterns. And I think I'll be getting more - the fox looks pretty cool! Not sure when I'll get time to knit them though!!!! 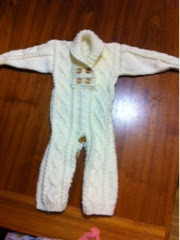 I was asked by a friend of a friend to make an Aran baby onsie that she'd seen on Facebook. 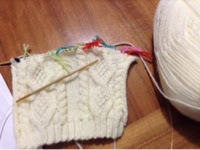 One an all-over Aran pattern and a shawl collar. I couldn't find a matching pattern so I'm mashing two patterns together. Just hope it turns out alright. So far so good. I've got the legs done so far and am getting my eye in on the pattern. Time now for some coffee, and then joining for the body! 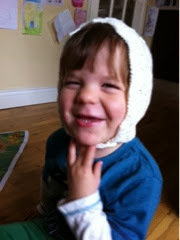 I was commissioned to make a cream bonnet for a 18 month old. I used Oliver to check the size.